The New York Times, which today (Jan. 31) detailed a massive attack upon its computer systems, is certainly not the first U.S. company to be hit by hackers apparently working for Chinese interests. George Smith, a senior fellow at the Alexandria, Va., think tank GlobalSecurity.org, believes corporations might be concerned that blaming China will make it harder to do business in China. “The Chinese actually have been blamed for a long time,” Smith said. “However, many U.S. multi-nationals, unsurprisingly, have business in China and aims directed at exploiting markets there. There’s more, quote from Sophos and F-Secure on the nature of the business world in relation to such intrusions. The New York Times is in a unique position. Its reputation and capabilities are based on the bedrock of truth and a relative transparency in the way it conducts news gathering and publishing. Most of corporate America does is not built on any such foundation. US businesses are not at all transparent. Hacking, intrusions of any kind, exacerbate their already existing environments of paranoia and secrecy. Everywhere, it’s part of what WhiteManistan has to say. They all talk like this and say it so often it would sound better if they sang it. Some do, using an assortment of similar refrains. Which is what this is about. From the comments for Gun Nut Folk Tune. When you sing it for them, the truth apparently is of a lower moral standard. Should leave the country, too. 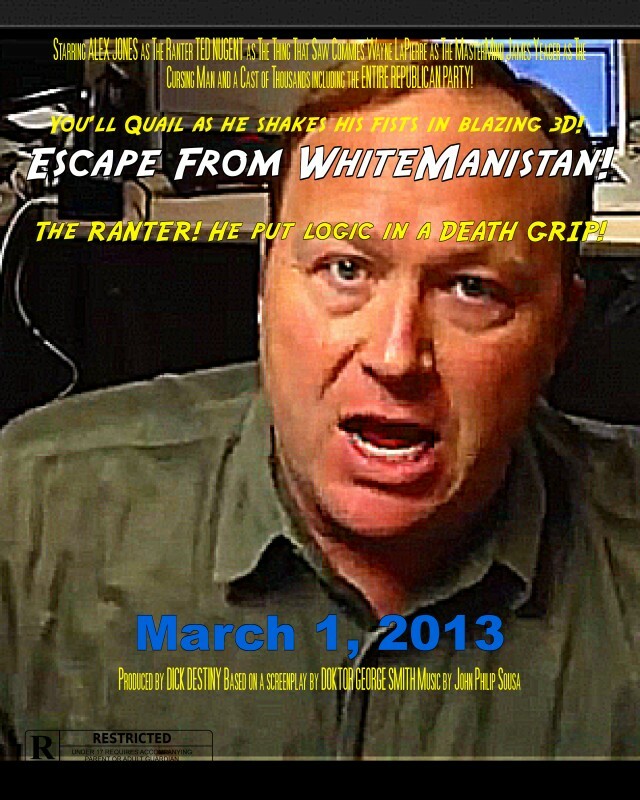 How is this ever going to be better than Escape from WhiteManistan!? Yesterday I was reading Howard K. Smith’s “Last Train from Berlin,” published in 1941 before this country entered the war. It’s an exceptional piece of reporting on the Nazi capitol just as it was beginning to sink in to the people of Germany that Hitler was not going to win the war and the day of reckoning, when it arrived, would be terrible. It eloquently captures the bleakness of Nazi Germany and a growing fear among its citizens. Entertainment died in Nazi Germany because the best of it involves telling the truth. But truth was forbidden. And most of the country’s artistic talent had either been driven out, imprisoned or killed. This caused a crash in movie attendance. Smith writes about German movies made to glorify the war effort. And one he picks to describe has some resonance when compared with the US taste for war movies during the last decade — which is nonexistent. The recent thing involving the good guys (or woman) torturing a bad guy and the hunt for bin Laden. The [German propaganda films] can be exhaustively described by a five-letter word. Lousy. Take the one called “Stukas.” It was a monotonous film about a bunch of obstreperous adolescents who dive-bombed things and people. They bombed everything and everybody. That was all the whole film was — just one bombing after another. Finally the hero gets bored with bombing and lost interest in life. So they took him off to the Bayreuth music festival, where he listened to a few lines of Wagnerian music, his soul began to breathe again, he got visions of the Fuhrer and guns blazing away, so he impolitely left right in the middle of the first act and dashed back and started bombing things again, with the old gusto. That’s wonderful writing. And the entire piece is like that. Americans no more want to see movies from Iraq, Afghanistan, wherever, than the people of Berlin wanted to see “Stukas” in the autumn of 1941. 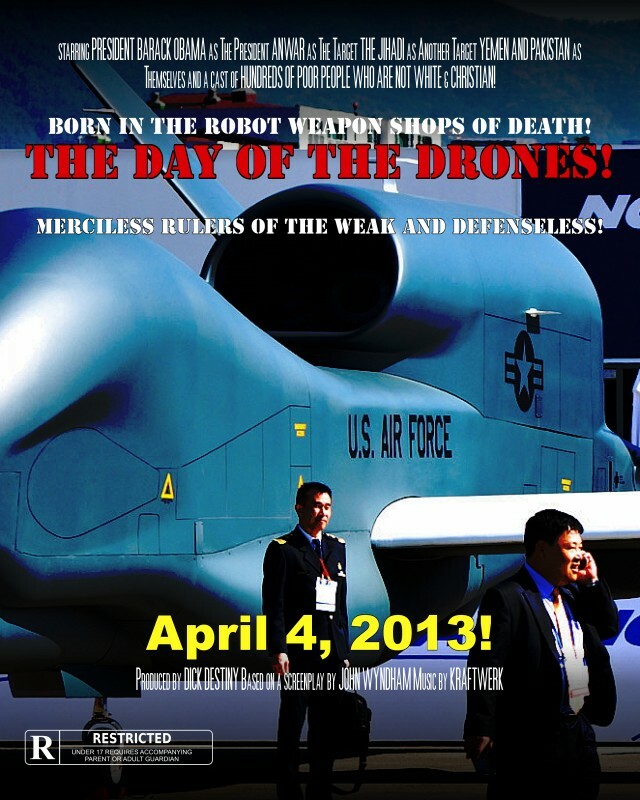 What, a real movie called “Day of the Drones,” showing the remote pilots between flying missions in a windowless building and returning to their tract homes in the suburbs, would have an audience? And it made me think about why I also detest the journalism that has evolved to cover the war on terror and the technology of America’s national security industry. Because it’s all like “Stukas” must have been. Deadening and stupid. Even when its young reporters work in some pallid snark, between the lot they never come up with anything even remotely as supercilious or appropriate as what’s in Last Train from Berlin. The reasons for that have always been fairly obvious. They can’t have the natsec biz and the Pentagon thinking they’re combative. The Blockbuster that will have all the critics talking! DD Filmworks — American Culture through Grindhouse! Get the soundtrack album, too! Proven by science, or at least by the Congressional Research Office, the legislative analytical arm looks into ‘profit shifting’ by American multi-national corporations. Profit-shifting is the practice of using global tricks to declare the majority of profits in tax haven countries while investing virtually zero in hiring and infrastructure in the same places. This is the utilization of small nothing-nations like Bermuda, Luxembourg and Switzerland, to launder profit so that tax payment to Uncle Sam are avoided. In such a way one has read news of US oil giants with central shell offices in Zug, Switzerland, or Apple routing its iTunes and iJunk store purchases through Luxembourg. This is not new and the Congressional Research Service does not phrase it so indelicately. But it is good that the agency has analyzed the trend — which is upward — and reported the truth in “An Analysis of Where American Companies Report Profits: Indications of Profit-Shifting,” ably distributed by Steven Aftergood and his Secrecy blog here. In other words, the financial structures of Bermuda, Luxembourg, the Netherlands, Ireland, Switzerland and others appear to have been modified and used exactly because they enable tax avoidance as international parasite nations. Again, “An Analysis of Where American Companies Report Profits: Indications of Profit-Shifting,” at Secrecy blog here. Get your advance tickets before it’s too late! Surprising how you can often make people look better than they do in real life by messing up their pictures. The grindhouse movie so real, you’ll think you’re living it! Another in the series of posters from a movie we’d love to see, perhaps starring Timothy Olyphant and Danny Trejo as tragic good guys. Not much of a surprise from the New York Times, a quick piece on corporate hiring in the economy that produces little. Corporate America is now hiring primarily through connections, which leaves anyone out of work for a long time discarded. America has always hated the unemployed. It also points out that resumes sites like Monster and Careerbuilder are largely a waste of time. Online job search is a waste of time. Once you have given up as I have, how is one expected to go out and try to put on a positive face when all one faces is no positive direction? Everything in the United States is a scam. For many, it’s a very accurate observation. Much of daily life is filled with scams from corporate America and to survive everyone must go about the task of trying to always avoid the tricks and traps. And the past four years have made it abundantly clear that no will exists anywhere in the country — except maybe in the writings of Paul Krugman — to lessen unemployment, decrease inequality, and raise the pay and declining living standards of average Americans. In fact, these are things that are vigorously opposed in the current system. Economists and other experts say the recession has severed networks for many workers, especially the long-term unemployed, whose ranks have remained high even as the economy recovers. “You’re submitting your résumé to a black hole,” it reads at one point. Although the phenomenon has intensified it’s not unique. When I was being trained in chemistry, none of the undergraduates (the bachelors and masters candidates) I worked with got first positions by sending out resumes in response to ads in the trade journals like Science and C&E News. It just didn’t happen. They could all use their rejection notices as wallpaper. When they got hired it was always through leveraging someone they already knew at a company, or pleading with a relative who worked at a firm to get them an in. Human resource departments were simply barriers. The New York Times piece spends a lot of time discussing hiring at Deloitte & Touche, one of the big parasite consulting and accounting firms of the country, a business that encompasses everything but which contributes very little observable to the social good. Another firm mentioned hiring more and more by acquaintance is a national rent-a-car company. If a rent-a-car company is run by people so venal and stupid that it thinks that the only good employees for standing behind a counter and working a scheduling and tracking program on a computer network, moving cars around a parking lot and handing out keys can be obtained only by digging through the friends of current workers, it speaks volumes about their regard for people, including their own.